If you entertain often, rustic casual dinnerware sets can help you set the mood for your guests and keep it informal and fun. Christmas dinner, of course is special. Most people go all out to make it memorable! If you’re like me, you’ll want to have more than one set of dishes. I love to use different dishes for all kinds of occasions! 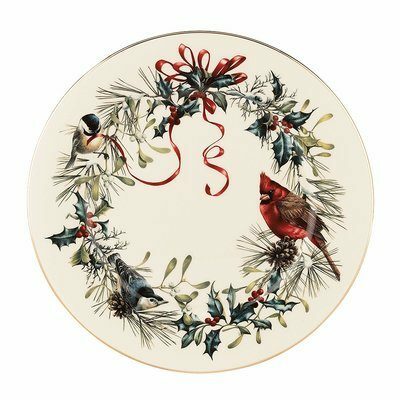 For example, I have special rustic dinnerware that I use in the summer, Christmas dinnerware sets for the holidays, dishes with a leaf pattern for fall and snowman dinnerware that I use during the winter months for a cheery table. I even have a few table settings of cabin dinnerware that I use for small but festive parties. Set the mood when you set the table. Choose dinnerware that reflects your personality and the occasion! There are all kinds of rustic casual dinnerware sets, and there surely is at least one design that will strike your fancy. For example, you can choose your rustic dinnerware sets by theme, by colors, by texture and by style. 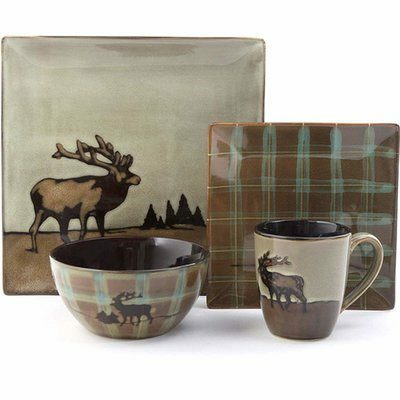 There are rustic dinnerware sets for people who are hunters, fishermen, wildlife lovers and horse lovers. 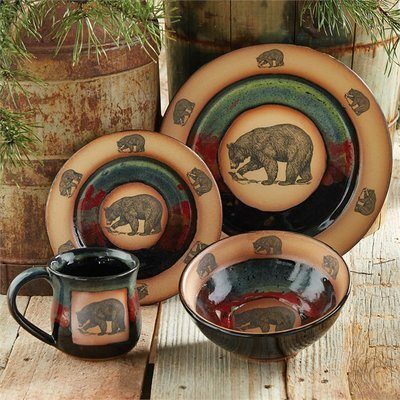 Rustic casual dinnerware sets can set the mood of your dinner, whether romantic, fun or adventurous. And you can choose the type of dishes that you want. You can get casual dinnerware that is stoneware, porcelain or even melamine. Melamine dinnerware, while a step up from paper plates, is not as fancy as stoneware or porcelain. But it does have its place. 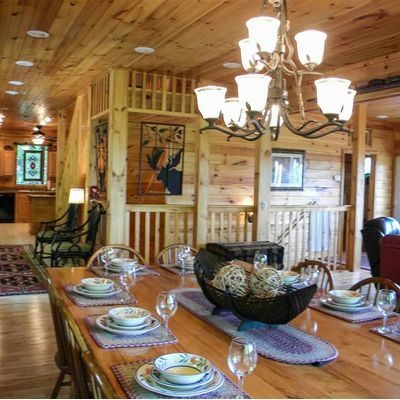 It is perfect for families with young children, for RVing, out on the deck, or for hunting and fishing camps. 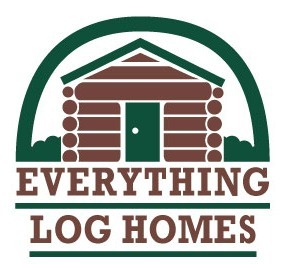 Make sure you include at least one nice rustic dinnerware set for your log or timber home. Memories are made from the little details in life. 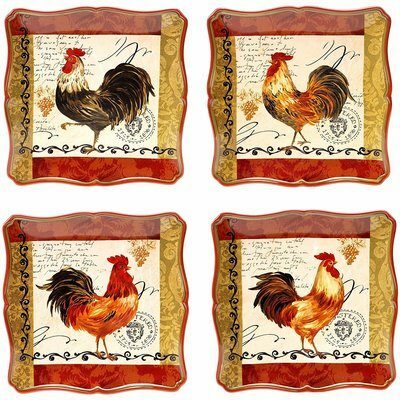 Novel rustic dinnerware makes your guests feel special and welcome! You can read more about country kitchen decorating here. 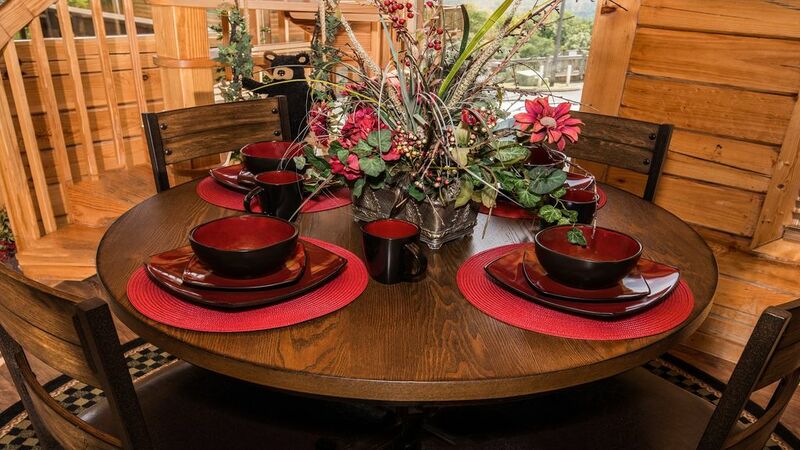 Southwestern dinnerware can set the tone for your Southwestern themed log home dining area. And many Southwestern design casual dinnerware sets are bright and colorful, giving your dining table a happy uplifting appeal! Southwestern dinnerware has two main themes. Some dishes reflect the Spanish or Mexican influence and past in the area. Others reflect Nature and the beautiful colors of the American Southwestern desert, canyons and rock formations. 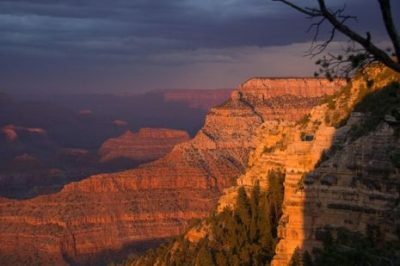 Note the beautiful colors in the Grand Canyon in the Southwest, as the sun sets. 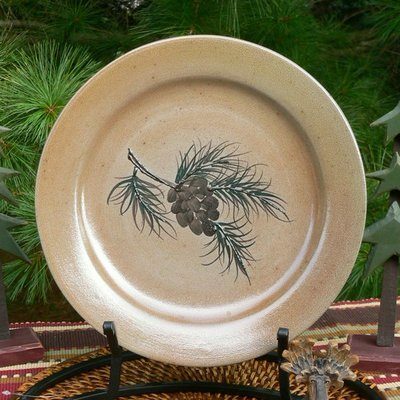 Rustic dinnerware reflecting nature uses informal designs and colors like tan, beige, coral, rust, browns and yellow. 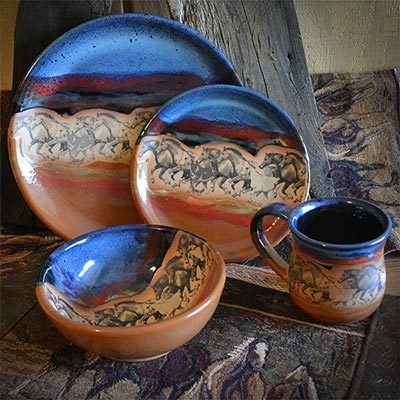 Ranches on the plains and in the desert are informal and rustic, as are the designs found on their dinnerware. Native Americans in the area often used natural colors and designs that they saw around them. On the other hand, dinnerware that has had Spanish or Mexican influence, often uses bright colors, colored stripes and bold designs. Most of the southwestern dinnerware that we see is pottery or stoneware, reflecting styles that have existed for many years. 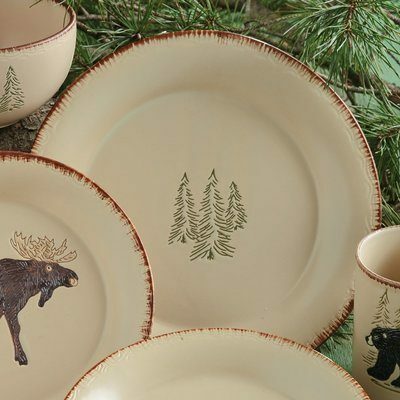 Western dinnerware is perfect for casual living if you live in a log home or timber frame home in one of the Western states, or if you just love the freedom of Western style living. You may be surprised to learn that much of the American West was not settled until after the American Civil War, in the mid-1800s. It was during this period that people started to move west, where the promises of riches, adventure and a better way of life drew the brave and adventurous. 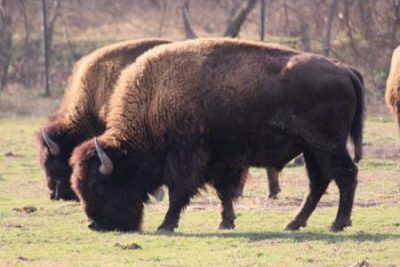 Buffalos were a common sight on the plains when the settlers first went West. Unfortunately you only see them in a few locations today. The American West (according to the U.S. census) includes these 13 states: Alaska, Arizona, California, Colorado, Hawaii, Idaho, Montana, Nevada, New Mexico, Oregon, Utah, Washington, and Wyoming. Americans traveled west for different reasons. Some traveled over mountains along dangerous wagon trails, seeking land for farming or ranches. Wagon trains followed a few wagon trails that went over the Rocky Mountains and through passes. It was a hard journey and there were many dangers. Others went west to seek their fortunes and make a quick buck. I’m sure you remember reading or studying about the Gold Rush in California and Alaska. There were many men who thought they would become rich, easily and fast, when they reached the far West. Saloons and ladies of the night followed the fortune seekers. And then other services were needed: general stores for food and household necessities, liveries for horses, feed stores, physicians. Stage coaches soon followed covered wagons and brought people to the West. Trains were eventually seen in the West. They carried necessary items for people who were living there. You may have heard of the Atchison, Topeka and the Santa Fe Railway. It was one of the largest railroads in the U.S. and one of the most well known. At some point, homesteaders and farmers started to clash with their neighbors who let cattle roam as they pleased. The farmers’ objection was that the cattle tended to eat or trample the farmers’ crops. The ranchers knew that their cattle would find the best grazing and weather, by moving naturally to the best areas. 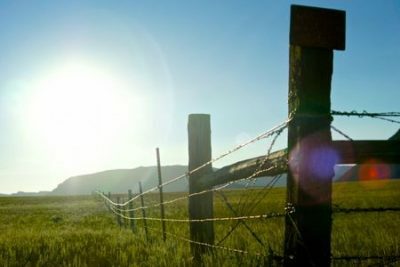 Barbed wire became a symbol of the struggles and turf wars between farmers and ranchers. Barbed wire, cheap and easy to install, began to be seen along boundaries in the West. Fences also became a point of contention between the two types of settlers. Sheriffs and deputies became necessary, to keep peace among the settlers and those passing through. Today, many parts of the West and Southwest remain sparcely settled. 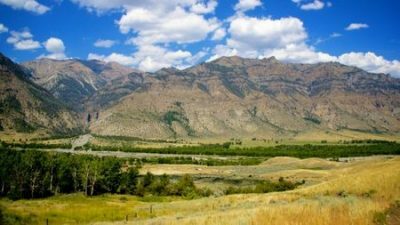 There are ranches with huge acreages, and many of the people living in these areas are fiercely independent. The history of the Wild West is the inspiration for many of the Western Dinnerware seen above.